Pork belly is a fabulous cut. It’s striated with layers of fat between the layers of sweet meat, which, when cooked slowly, melt and baste the joint from within. The English finally seem to be catching on to the idea that belly pork is a good, good thing. I challenge you to find a gastropub menu that doesn’t feature belly pork. It pops up much more often in all kinds of restaurants than it used to (I remember a time not so long ago when the only restaurants serving it were in Chinatown), and it’s appearing much more frequently in supermarkets, so you no longer have to ask for it specially at the butcher’s. It’s also a pleasingly inexpensive cut of meat; you’re paying mere pennies for one of the tastiest bits of the pig, which represents real value. Pork and apples are natural friends, so I’ve served this slow-roasted joint and its crackling with a cidery, creamy shallot and bacon sauce, and slices of sweet fried apple. Gather your windfalls now – this is a perfect autumn dish. Preheat the oven to 150° C (300° F). Use kitchen paper to dry the pork rind well. Score rind of the belly pork in lines about half a centimetre apart with a sharp craft knife, and rub it with salt and pepper. Cut the onions in half and place them, flat side down, in a metal roasting tin, then rest the pork on them – the onions should form a platform for the pork so it doesn’t touch the hot tin and sit in its own fat. Put the pork in the oven for 3 hours and forget about it. When the time is up, turn the heat up to 200° C (400° F) for a final 20 minutes. Remove the pork from the oven and put it under a hot grill until the skin crackles evenly (about five minutes). Keep an eye on the pork under the grill – it is easy to singe the skin. Finally, leave the pork in a warm place to rest while you prepare the sauce. Chop the bacon into little lardons and fry without any oil in a non-stick frying pan. When the bacon is crisping up, remove it to a bowl, keeping any bacon fat in the pan. Slice and core the apple, leaving the skin on. Fry the apple slices in the bacon fat until golden and set aside. (If the bacon hasn’t released enough fat, use a spoonful of pork fat from the roasting tin.) Finally, slice the shallots finely and brown them in the bacon fat over a medium flame. Keeping the pan on the heat, add the bacon to the pan, pour over the cider and bring it to the boil for two minutes to burn off the alcohol. Add the crème fraîche to the pan and stir well, and finally add the cooked apples. Serve the pork on a bed of the sauce and apples with some mashed potato and a green vegetable. I am pathetically proud of having successfully cooked a strip of Chinese roast belly pork (siew yoke or siew yuk, depending on how you transliterate it) at home. This pork, with its bubbly, crisp skin and moist flesh is a speciality of many Cantonese restaurants. An even, glassy crispness is hard to achieve if you’re making it at home, but I think I’ve cracked it; with this method, you should be able to prepare it at home too. You’ll need a strip of belly pork weighing about two pounds. Here in the UK you may have trouble finding a belly in one piece (for some reason, belly pork is often sold in thick but narrow straps of meat); look for a rolled belly which you can unroll and lay flat, make friends with a pliant butcher or shop at a Chinese butcher (you’ll find one in most Chinatowns). Look for a piece of meat with a good layer of fat immediately beneath the skin. The belly will have alternating layers of meat and fat. Try to find one with as many alternating strips as possible. Bring the water and vinegar to the boil in a wok, and holding the meat side of your pork with your fingers, dip the rind in the boiling mixture carefully so it blanches. Remove the meat to a shallow tray and dry it well. Rub the sugar, salt, five-spice powder, cinnamon, Mei Gui Lu jiu and garlic well into the bottom and sides of the meat, leaving the rind completely dry. Place the joint rind side up in your dish. Use a very sharp craft knife to score the surface of the rind. If your rind came pre-scored, you still need to work on it a bit – for an ideal crackling, you should be scoring lines about half a centimetre apart as in this photo, then scoring another set of lines at ninety degrees to the original ones, creating tiny diamonds in the rind. Rub a teaspoon of salt into the rind. Place the dish of pork, uncovered (this is extremely important – leaving the meat uncovered will help the rind dry out even further while the flavours penetrate the meat) for 24 hours in the fridge. Heat the oven to 200° C (450° F). Rub the pork rind with about half a teaspoon of oil and place the joint on a rack over some tin foil. Roast for twenty minutes. Turn the grill section of your oven on high and put the pork about 20cm below the element. Grill the meat with the door cracked open for twenty minutes, checking frequently to make sure that the skin doesn’t burn (once the crackling has gone bubbly you need to watch very closely for burning). The whole skin should rise and brown to a crisp. This can take up to half an hour, so don’t worry if the whole thing hasn’t crackled after twenty minutes – just leave it under the grill and keep an eye on it. Remove the meat from the heat and leave it on its rack to rest for fifteen minutes. Cut the pork into pieces as in the picture at the top of the page. Serve with steamed rice, with some soya sauce and chillies for dipping. A small bowl of caster sugar is also traditional, and these salty, crisp pork morsels are curiously delicious when dipped gingerly into it. The UK’s most splendid pub snack is, for my money, a lovely salty bag of pork scratchings. These aren’t at all like American pork rinds, where the skin from some pork is separated from the fatty meat and baked; the English version uses that fatty layer which, along with the crackling skin, is rendered into a fatty, crunchy, salty mouthful that’s perfect with a beer. When we lived in France, Dr Weasel and I discovered that there’s something even better than pork scratchings: duck scratchings. Ducks which are raised for foie gras don’t end their usefulness with the sacrifice of their liver. Their plump breasts are sold as magret de canard; their fatty thighs and wings are preserved in confit; and the bits of fat from inside the bird and the trimmings of skin are rendered down for cooking fat. The crispy bits, or gratons, left over from the rendering are sold in some French charcuteries as a snack to accompany drinks. They are light, crisp, puffy and delectably ducksome. My Dad was cooking a couple of ducks the other day, so we saved the extra skin and the poultry fat from inside the birds to render. The best way to do this is in a frying pan on the hob; baking the gratons will make them cook down unevenly, and may result in some burning. Continue to cook the gratons, turning and draining occasionally, until they are crisp and an even gold colour. Use kitchen paper to absorb any extra fat – your gratons should be dry to the touch and puffily crisp. Season with salt and pepper and serve warm with drinks as a pre-dinner snack. I’m leaving for America for a few weeks tomorrow morning. I’ll try to keep the blog updated, but I’m hoping the wireless provision at the Horizon Casino Resort in Lake Tahoe has improved significantly since last year. I’ve somehow managed to score a booking at Picasso in Las Vegas too, which is tremendously exciting – watch this space for a review. 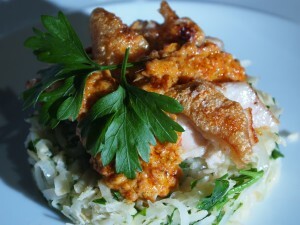 See this post for methods to get your pork crackling crisp and puffy. I bought this belly pork from Sainsbury’s to see how successfully it would roast; I’m looking for belly pork to make Siu Yuk, a Chinese crispy belly pork with, and am roasting it in a European style until I find a successful joint which is fatty enough. This joint wasn’t fatty enough, but it made a rich and delicious supper roasted Italian-style with lemon, fennel and onions. Update – about a year later, I did manage to track down some pork which was just right for Chinese crispy belly pork. You can see that recipe here. The joint was really quite disturbingly lean and upsettingly tiny (this is what I get for supermarket shopping late at night in the middle of the week), but at least it was nice and dry. 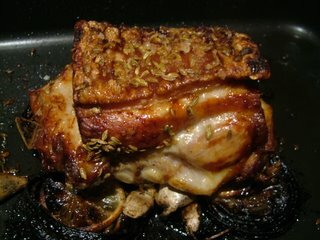 It’s not always easy to find belly pork on the bone in the first place; when roasted this only yielded about two tablespoons of fat. Amazing; this is where a pig stores its body fat, and I would expect to see nice, thick lines of white fat separating the layers of lean meat, with a soft layer beneath the skin to aid crackling. This pig had been working out (or had been bred for lean meat, but there’s a whole post on exactly what I think of modern farming methods waiting to be written one day when I’m in a bad mood). I had some lard in the fridge from a pork joint I cooked a while ago, and used that to annoint my anorexic pig-tum. Prepare the pork skin for crackling, being very sure on this small joint to keep your scoring close. Rub the surface with salt, pepper and half of the fennel, and place the whole joint in a roasting tin on top of the sliced onion and lemon (skin still on), sprinkled with the rest of the fennel, and the whole cloves of garlic. Roast at 220°C for half an hour, then bring the temperature down to 150°C for twenty minutes. Rub the skin with the lard, and finish the joint under a hot grill for around five minutes, watching it carefully to stop the crackling from catching. I served this with mashed potato and sweet red and yellow, pointed peppers which I grilled in a griddle-pan on the top of the oven, mixing the juice from the peppers with the pork’s pan juices to make a kind of gravy. Rich and delicious. Cripes. 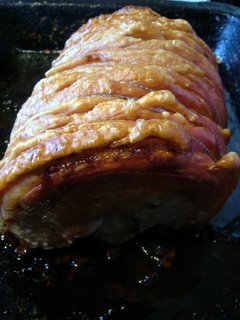 Make that “Roast pork with award-winning crackling”. A few years after I wrote the post below, the recipe ended up being tested on the Guardian’s Word of Mouth blog, where it beat the competition hollow. This would be unremarkable it that competition hadn’t been Hugh F-W, Delia, Prue Leith, Good Housekeeping and Simon Hopkinson. Get to it with that hairdryer. These days, it can be hard to find meat that hasn’t been treated in processing with water and glucose to make it moister and heavier. 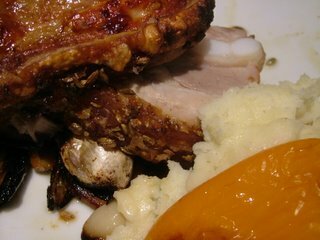 Even when your joint of pork is free from these additives, it can be difficult to treat it in a way that results in roast pork with a popcorn-crisp, crackling skin. 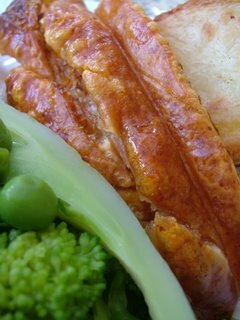 When you do manage it, puffed, salty crackling is a delectable thing of wonder. The technique has a lot to do with using varied cooking temperatures, and absolutely everything to do with making sure the skin is prepared properly before it even gets anywhere near the oven. Modern joints are harder to raise a crackling skin from than the joints I remember from when I was a little girl. This has a lot to do with consumer demand for extra-lean, muscly meat, which just doesn’t have enough fat to make the magic happen. Look for a joint with plenty of fat under the skin. This is a 2kg rolled loin: enough to serve six people with plenty for sandwiches later. Although convenient, rolled joints are also hard to make crackle, especially where the skin meets the roasting tin. Don’t despair, though; you can still make it work with a bit of preparation. The day before you eat, the skin of your pork must be dried thoroughly with paper kitchen towels, and scored well. Even if your butcher has already scored it, you will probably benefit from making sure the scoring is fine and regular, so you will want to add your own cuts to the skin. Use a craft knife on the cold skin of the meat (this is easiest when the skin and fat are cold and firm), scoring it in lines about half a centimetre apart. When the joint cooks, the fat will melt and bubble through those lines, crisping the skin it touches. Rub salt into the skin, as if the pork were somebody you are particularly fond of who is demanding a lovely exfoliating massage. Every family has its own gravy method, just like Tolstoy said. (Mr Weasel tells me that this is not what Tolstoy said at all. Pshaw. It’s what he should have said.) While you rest the joint for ten minutes in a warm place, make gravy to your family recipe. Remove the carapace of crackling, carve the meat and divide the splintering crackling between the plates. 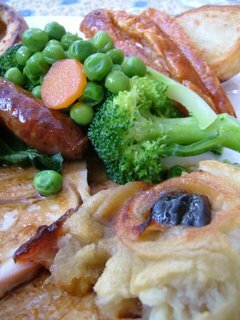 Serve with Yorkshire pudding, roast potatoes, green vegetables and apple sauce. Hooray for the old days.